Another one of a kind album out of Jay Tholen. Tholen's serene use of electronics, samples, and his own voice evoke a very specific mood. Something between a one man band and a one man church. It is authentically Jay Tholen though. The religious, heavily introspective focus in the lyrics, along with soft, floating notes. This album flows between tracks and will feel over in an instant. Like most Jay Tholen albums, pay attention to the opening and closing tracks. This guy really knows how to bookend an album. It's been a while since I sat down and listened to the music of the man who created some of my all time favorite albums. No specifications or qualifiers. Tholen has a very unique view in all his art. I first learned of Tholen as a musician though, and always felt he brought that unique view, even in his early chiptune days. Hope Jay Tholen keeps creating things for a long time. Download includes 7 fancy wallpapers. Celestial Archive is an exultant gospel-adventure through mundane, everyday moments — a beach, a breakfast table, a coloring book, an insecurity — that charts an unhurried, drifting course from song to song, scene to scene, and riff to riff. Musically, Celestial Archive evokes vastly disparate sounds: from the wailing, choral psychedelics of the Flaming Lips to the gentle and fervent lyrical energy of Sufjan Stevens. Cheerful, synthy organs and sax blend seamlessly with gritty, reverb-heavy guitar and vocals. The end result culminates in a sound that touches genres from chiptune to prog, and makes for an affair that carefully straddles the line between ‘fun, easy listening’ and ‘thoughtful aural experience’. 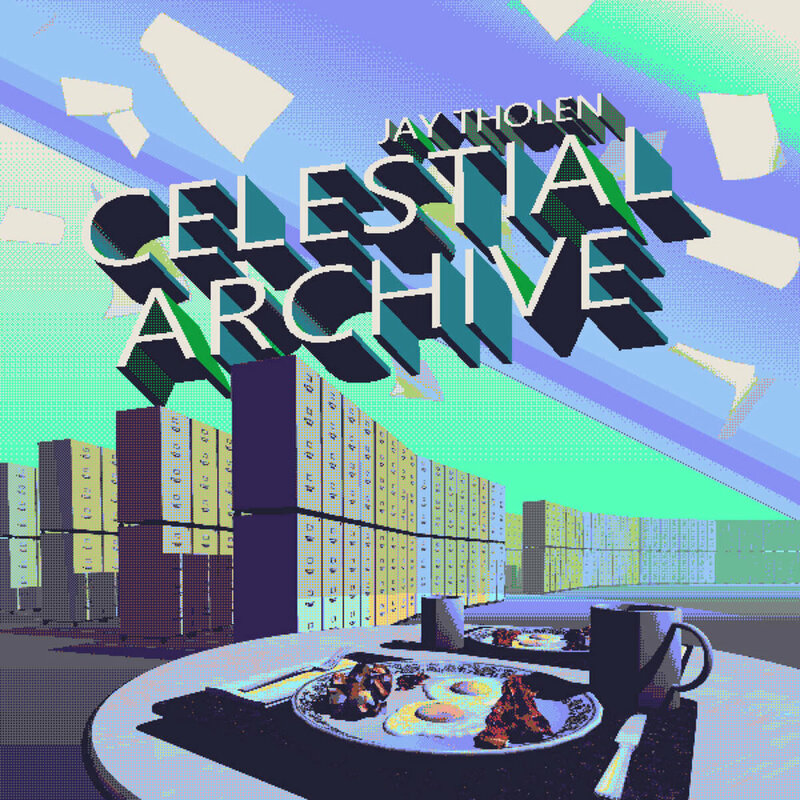 Tholen’s 30th release, Celestial Archive has all the crusty, vaporwavey, art-rock goodness that fans have adored over the years, while simultaneously presenting a polished and diverse phonic thesis. While songs like “The Second Greatest Meal” and “Onus Productivity Suite” may seem out of place at first, this album is a love letter, and with trust, it guides the listener expertly. From the majestic highs of “Celestial Archive of Ornately Authored Plans” and the cover of Soul-Junk’s “Bridesong” from his album 1954, to the struggles and anxieties that arise across songs like “Even Though” and “Do I Deserve This?” the album explores what it means to love and be loved; as well as, how unexpected, random, and challenging the experience of love can be. Swells of sound carry forth joyous synths, instrumentals collaged and created, honest words and gleeful melody; each track on ‘Celestial Archive’ is a collection of effervescent notes woven together to form a golden tapestry of hopefulness. Like waking to a spring morning for the first time after a winter that seemed to promise to never end. A frost, long frozen, finally has begun to thaw, blades of pale grass and brave violet blossoms stretch skywards, dare to reach up towards the sun, feel its rays warm them, stand tall and are freed all at once of the last casts of ice clinging above their roots. Rich earth, warming and again welcoming to the life it holds within it, parting with a soft sigh so that saplings can begin their journey to embrace the sky. The landscape shifting, from blanketed shades of white and grey reaching past the horizon, to technicolor flashes of light and feeling, vivid tones shimmering and bold, sure of themselves at last, claiming victory for the season. Permafrost that threatened to hold fast, gnashed its icy teeth, now already being forgotten, air warm and glowing golden like sweet honey, poppies bloom and sway together rapturously in soft breezes. The season has exhaled and it smiles; pure joy, all love, let loose the hold of winters passed, look forward to leaves embraced in morning sun. Swells of sound again carry forth their golden tapestry and with them, bring this new season.